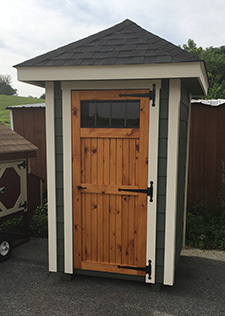 The best in quality craftsmanship, our Amish built garden sheds can be customized to your exact needs. Do you need to store wheelbarrows, lawnmowers, shovels, hoes and trowels? Whatever storage you need for your lawn and garden we can build your shed to suit. Our sheds provide a beautiful solution to neat and orderly outdoor storage. Great for pool storage too. Let us help you design your garden shed or email your drawings for a quote. info@LancasterChickenCoops.com or call (717) 553-0215. You can also fill out the form below with your questions or specifications. Our garden sheds are made by hand with wood or Engineered wood siding and painted or stained to the colors of your choice. Choose from a metal roof or shingles. All our materials are top quality and have manufactures warranties. 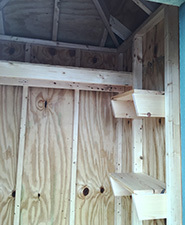 Call (717) 553-0215 with questions or to order your Amish made duck house. Garden Sheds Can Be Delivered Anywhere in the Continental US. They Will Arrive Fully Built. 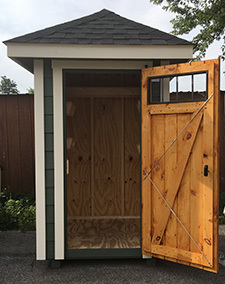 Garden shed are built by Amish craftsmen from scratch and can be easily customized to your specifications. Our Handcrafted Garden Sheds are Great for Lawn and Garden Storage and Pool Storage Too!.